We all have things which can hold us back in life, or make us hesitate with certain choices. Even our strengths can sometimes be the very things which hold us back, or make it difficult for us to really step outside of our comfort zones. 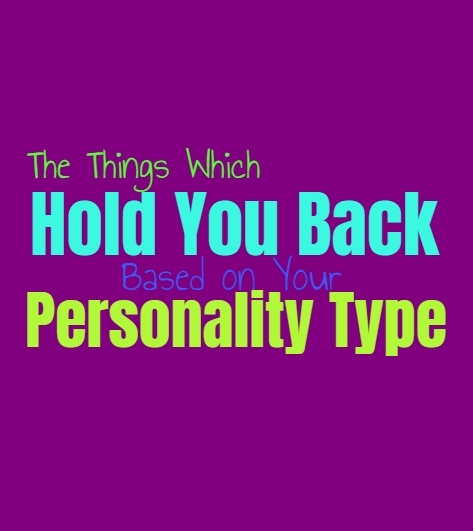 Here are the things which might hold you back, based on your personality type. INFJs are often held back by a feature of failure or regret. They are perfectionists who put a lot of pressure on themselves to be successful. This desire to get everything perfect, makes it challenging for them to really take chances in their lives. Sometimes this can cause the INFJ to remain stagnant, afraid to take risks which might lead to some sort of failure. They want to get things right and don’t like being someone who steps out only to disappoint the ones they love. For INFJs failure and regret can be awful things to experience, and so they often find that these fears hold them back if they do not fight them. INFPs can often feel held back by a lack of motivation, and a desire to keep inside of their own little worlds. They might be afraid that others won’t fully understand them, and this can make them hesitate when it comes to putting themselves into new social situations. INFPs have vivid inner minds and strong inner morals, but these strengths can sometimes be the things which hold them back if they do not find a sense of balance. INFPs might be stubborn when it comes to what they believe to be right and good, not fully recognizing someone else’s point of view in these situations. ENFPs can sometimes feel held back by their desire to explore new things, rather than allowing themselves to remain still. They find themselves wanting to experience life and explore their options, and don’t always take the time to look at what they have in the present moment. ENFPs bounce around not wanting to feel bored, but this can sometimes block them from appreciating the things they have in their more steady aspects of life. ENFPs can also have a hard time seeing other points of view when they are morally connected to something, and while these strong morals are wonderful they can also hold them back in these situations. INTJs often have a desire to be the best at everything and to always be right. They want to uncover the truth and will do whatever it takes to be straightforward and accurate. Their desire to focus on logic is certainly something which is a strength, but also holds them back in certain situations. Sometimes their blunt delivery and focus on facts, can cause the INTJ to miss out on some aspects of a situation. While emotions might not be their favorite things to focus on, they are something to consider and are also part of seeing the full picture. ENTJs are often aggressive people who focus on getting things done as efficiently as possible. This can often be the very thing which holds them back, since they are perfectionists who don’t want to make any mistakes. They can be hard on themselves and others, never really letting up when it comes to getting things done correctly. ENTJs can be a bit too stubborn sometimes, especially when they feel like they are right in a situation and don’t have time to waste listening to the opinions of others. INTPs can often be fearful that they will be misunderstood or taken advantage of, and this is often what holds them back. They find themselves wanting to analyze a situation to uncover the truth, but they might start filling in the blanks when no answers are found. This can cause the INTP to be nervous about taking those next steps into a certain direction, and can halt their motivation completely. Constantly questioning themselves and others is something the overactive INTP can be prone to, causing them to feel held back because of it. ENTPs can be rather headstrong and eager people, always wanting to jump into something new. They believe in challenging themselves and really don’t like feeling stagnant. Sometimes this curiosity and desire to keep moving, can be the exact thing which holds them back. This is because ENTPs might be so focused on removing boredom and stangancy from their lives, that they forget to appreciate the things which they have in front of them in the moment. ENTPs also want to constantly feel challenging, and can put themselves into difficult situations because of it. ISTJs can often be held back by their sense of focus and desire to remain with what they know. They don’t like stepping outside of their comfort zone and want to be prepared for everything. This can actually be something which holds the ISTJ back from taking chances, ones which might be beneficial. They don’t like making choices without being absolutely sure of them, and this can hold the ISTJ back sometimes. ESTJs are often held back by their desire to always be right and to get things done perfectly. They don’t like taking chances on something unknown, instead the ESTJ wants to be sure of everything before moving forward. They want to be sure that they are making the smart choices, and don’t like taking risks which might lead to failure. This can make it so the ESTJ does not want to step outside of their comfort zone, which can sometimes hold them back. ISFJs are very focused on caring for others and want to be sure they are making the right choices in life. They can be fearful of making mistakes and truly dislike stepping outside of their comfort zones. This desire to remain within their comfort zones and always be sure of their choices, can definitely hold the ISFJ back from opening up and taking risks. ISFJs can also be afraid of doing something new for themselves, since it could hurt someone they love if they fail. ESFJs are often perfectionists and this can be the very things which holds them back. They want to be sure that their actions do not negatively affect the ones they love, and so they can be overly cautious sometimes. ESFJs don’t often take risks which they personally want to explore, because they seek to avoid harming anyone they care for. Their focus can be so much on others, that this actually holds the ESFJ back from enjoying themselves and experiencing new things. ISTPs are adventurous spirits who enjoy learning and living in the present moment. Their desire to experience a sense of independence can sometimes prevent them from standing still and appreciating the steady things in life. ISTPs want to live a life free of obligations, wanting to be able to make their own choices without feeling controlled. This distance can sometimes cause them to hold themselves back from certain connections, especially with people who care for them. ESTPs can sometimes focus so much on living in the present and seeking out excitement, so they hold themselves back from making more steady choices. ESTPs don’t want to feel controlled or held back, and this can be the exact thing which does hold them back. They might have opportunities in their career or relationships, but their desire to live in the present can hinder their ability to see around the corner. ISFPs can sometimes be held back by their desire to make choices based on their own feelings. When something does not feel quite right, ISFPs don’t want to settle and so they can bounce around a bit. When the ISFP finds themselves bouncing from one thing to the next, it is something which feels right in that moment but might actually hold them back from settling down in a situation which could make them happy. ESFPs can often be held back by their inability to see far around the corner in life. They live so much in the present and don’t like feeling weighed down by future decisions. This desire to enjoy the moment can make the ESFP happy at the time, but cause them to hold themselves back in some ways. They don’t always take opportunities which could make them happy, because they are so focused on just enjoying the present.